Now that you have configured the integration in AdvocateHub and TrustRadius, you can create a challenge which automatically verifies whether or not a review has been submitted to TrustRadius. 1. Head to Challenges > Add a Challenge > Blank Challenge. 3. Enter the API Integration stage to edit. 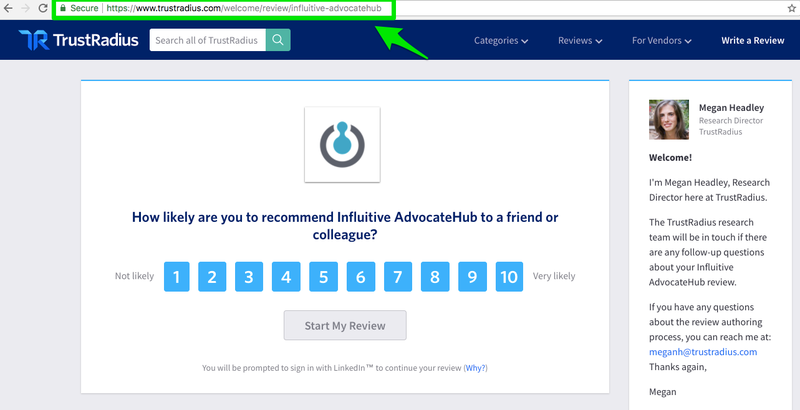 You must include a specially formatted link to your product's TrustRadius reviews page in the Stage Description. This will allow the challenge to recognize who has actually submitted and written a review. 2. Head back to the tab/browser with the challenge, and in the API stage, paste your TrustRadius URL in the Stage Description. 3. Customize the action button for advocates to advance the stage e.g. : I submitted my review! 4. Customize the notification the advocate sees after they submit the review. e.g. Thank you, for helping others like you make a great purchase decision by sharing your review! When you're done with all the technical details above, like any challenge, all that's left is to assign a point value, Save, target and Publish it. If your organization has multiple products, or you want to create a separate challenge for a campaign, you may find yourself in need of a second (or third) TrustRadius review challenge. No problem! To execute this, you'll need to understand a couple of things about the stage configuration we discussed above. The API Code field in the API Integration stage must always be identical to the target-influitive-stageapicode= portion of the TrustRadius URL you send advocates to. The API Code and the URL value target-influitive-stageapicode= values must always be unique for each new challenge you create. This lets TrustRadius know which challenge should be completed when that product is reviewed. Thus, when you create new challenges, just change the API Code (to whatever you want - as long as it is different than the other challenge stages) and the target-influitive-stageapicode= value in the URL and you're all set. Remember that these must always be different than the values used in other challenges.